Camping at Telowie is not allowed anymore from September 2015 onwards. 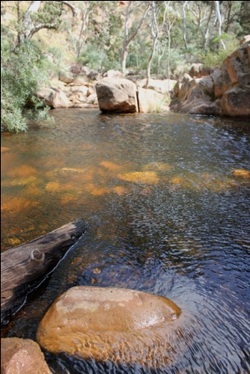 Telowie Gorge Conservation Park is located off Highway 1, around 45mins from Port Pirie. The campground is located before you get to the main car park of the Gorge, and is comprised of 2 sites only. They are really just patches of ground, surrounded by trees. Not much privacy from either site. Caravans and trailers could utilise these sites, though turning room would be limited. We cannot see any real benefits to wanting to camp here. There are no facilities at all. No camping allowed in the Gorge itself, which is understandable as its very narrow and would destroy the area. 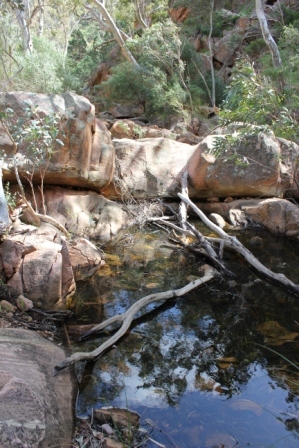 To access the Gorge you need to walk up the road from your campsite and from there a walk (known as the Nukunu Trail) suitable for all ages is available, and takes you through very pretty gorges and rockpools (as seen to the left). There are no toilets or water available at this Gorge either. Children will love looking in the rockpools and the multitude of tadpoles that abound in them. We have seen the largest tadpoles (they remind us of small ugly fish) in this water. Wallabies are meant to be around this area as well, though we have never seen any. I would recommend if looking to camp, travel an extra 30 minutes to Mambray Creek, rather than stop off to camp at Telowie. Its a lovely Gorge for a visit but not a spot to camp.